1.In small saucepot, prepare quinoa blend as label directs with 1 teaspoon olive oil; stir in almonds. 2.Meanwhile, in small bowl, stir horseradish, mustard, lemon juice, tarragon, salt and pepper until well blended. 3.Heat remaining 2 teaspoons oil in large skillet over medium-high heat. Add salmon, skin side up; cook 5 to 6 minutes or until golden brown on bottom. Turn salmon and cook 4 to 5 minutes or until internal temperature reaches 145°; spread some horseradish-mustard sauce over salmon pieces during last 3 minutes of cooking. 4.Slide spatula between skin and salmon to remove skin. 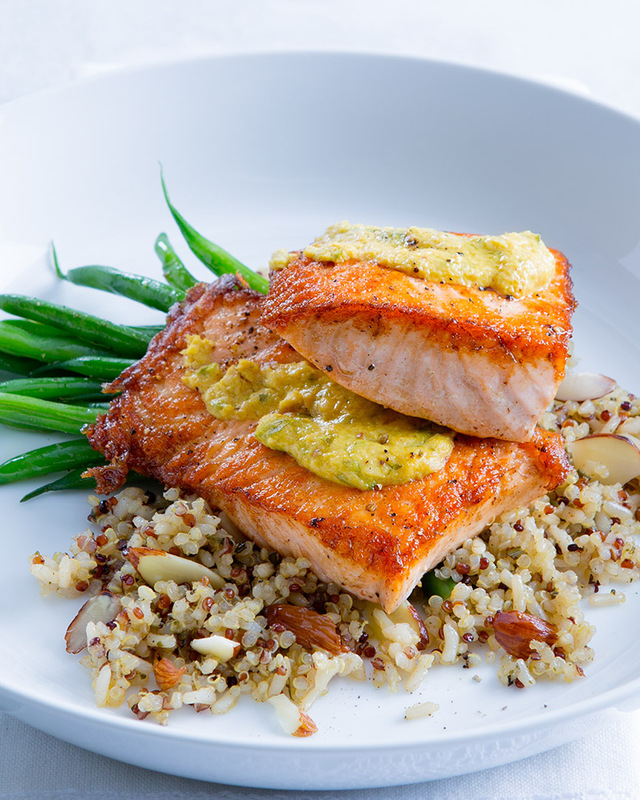 Serve salmon over quinoa blend drizzled with remaining horseradish-mustard sauce; garnish with lemon slices, if desired. > If you have a rice cooker, you can use it to make quinoa! Just use a 2:1 liquid-to-quinoa ratio and follow the instructions on your rice cooker.